It’s been an incredible journey. 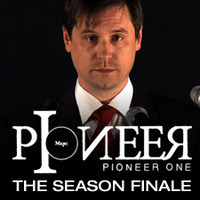 From progressive P2P experiment to massive global online success, Pioneer One is finally wrapping up. We’re definitely feeling a sense of nostalgia here at BitTorrent. All the credit and our infinite respect go to filmmakers Josh Bernhard and Bracey Smith and to Jamie King at VODO for his tireless efforts. We are extremely proud to have offered promotional support for such a worthy venture. Pioneer One was one of our original Spotlight Artist ventures, before we even formally created the program. “War of the Worlds” begins as Taylor prepares to go to the public with Yuri’s story, and everyone discovers the consequences of their actions in this wrenching finale to the heart-stopping series. What will happen? You will just have to watch and see! We know we can’t wait to find out. Congratulations to the entire team at Pioneer One and VODO for all of your success, and a huge THANK YOU for believing in the BitTorrent community. Your efforts have opened new doors for independent filmmakers everywhere. A toast to you. Link for download of episode and series not working!! !